That last week didn't see too much in the way of painting, but I did get some gaming in. Over the past few years, I have been playing an online/email global conquest game call Lords of the Earth. Sadly, most of the campiagns have gone silent. Fortunately, some members of the group have started a Pathfinders RPG play by email/message board game. We are all eager to get started- the past week has been full of creating characters, planning with other players, etc. In short, it was a great gaming week even though little actually gaming took place. My character? Muckles O'Barley- Halfling Sorcerer. It should be fun! 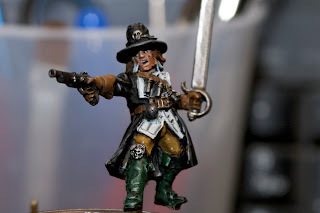 On the painting front, the Witch Hunters got another member of the party. This time an actual Witch Hunter! This model was one of the free models from Adpeticon. What a great model to get for free, and it was an instant addition to my warband. Last night I started working on some Imperial Guard Tanks! It is heavy support month! I'll get some pictures posted soon. Also, I got some weathering kits from Secret Weapon Miniatures. They should be here soon, and I can't wait to use them. That's a freaking sweet model, did everyone get one of those? Looks like he'll be a great addition for your warband. Good luck with the rpg stuff... makes me nostalgic. I am pretty happy with his face, which has been one of the areas I've struggled with the most in painting.